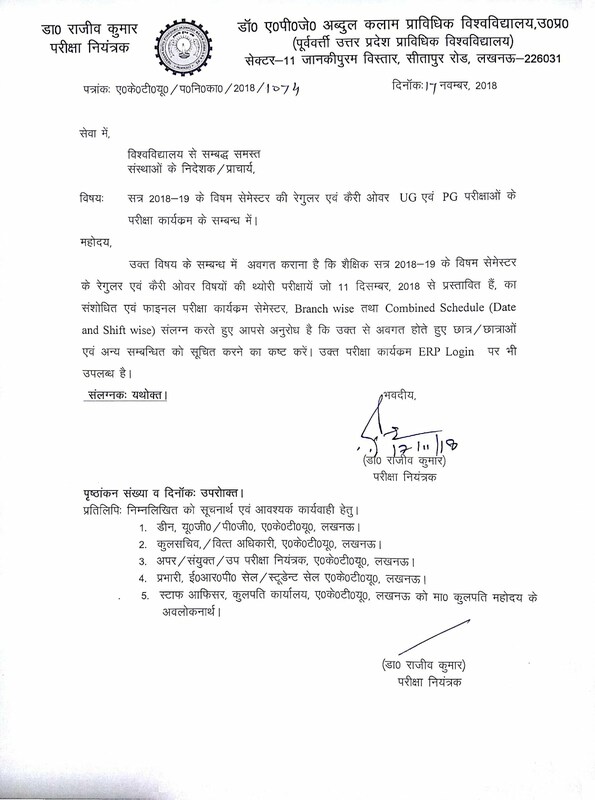 AKTU/UPTU Odd Sem Date sheet 2018-19. Download AKTU (UPTU) B.Tech Odd Sem 1st 3rd 5th 7th Sem Exam Schedule/Time Table 2018-19 Pdf (FINAL) at aktu.ac.in. Aktu has released the ODD Semester UG/PG Examination final schedule/Time Table for academic session 2018-19 Exams on its Official Website www.aktu.ac.in. AKTU has released the examination schedule for the UG and PG courses like B.Tech, B.Pharma, MBA, MCA, B.Arch, BFAD, BHMCT, MAM etc. The Dr APJ Abdul Kalam Technical University released the Official Circular for AKTU ODD Semester Examination Final Date-sheet for session 2018-19. AKTU is going to conduct ODD Sem UG/PG Examination for academic session 2018-19 in December 2018 - January 2019 month. Theory and Practical Examination 2018-19 will start from 11th December 2018 to January 2019. AKTU Odd Semester Carry Over Paper (COP) 2018-19 will be held with Main Theory Exam. The AKTU Admit Cards for odd sem exam is likely to be released 10 days prior to the exam. AKTU has released the examination schedule for the UG and PG courses like B.Tech, B.Pharma, MBA, MCA, B.Arch, BFAD, BHMCT, MAM etc. The exam will be held in 2 shifts, morning and evening and timing will be 09:30 AM and 02:00 PM. Eligible students can download odd semester theory exam 2018-19 online admit card from aktu.ac.in, the link will be provided before the exam. The Students can download AKTU Odd Sem Exam Final Date-sheet 2018 – AKTU 1st 3rd 5th 7th Sem Date sheet 2018-19 for B.Tech B.Pharma MBA MCA B.Arch (1st/2nd/3rd year) from the link given below. AKTU ODD Sem Result 2018-19 Expected Date:- February 2019.